As colour imaging takes on increasing importance in a range of products and technologies, colour fidelity across different media has become essential. This book has arisen from the need for a specialist text that brings together key developments in colour management technology and findings from the colour engineering research community. Edited by highly regarded specialists in colour management systems, Colour Engineering introduces the reader systematically to the art of constistent quality of image reproduction - regardless of the monitor or graphic user interface employed. a thorough review of the elements of colour science that apply to colour imaging. a comprehensive analysis of methods for characterizing devices in the colour imaging chain. a review of the key topics in colour management. the different approaches to implementing colour systems at some of the leading exponents in the imaging industry. 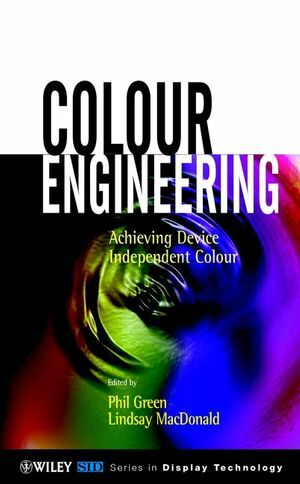 This authoritative book depicting the latest developments in colour imaging, written by a group of authors at the forefront of research in this exciting and fast-moving field will appeal to students as well as practitioners of the new discipline of colour engineering. Phil Green is a member of the Colour Imaging Group at the London College of Printing, and Course Director of the college's postgraduate programme in Digital Colour Imaging. He worked in the printing industry from 1975, joining the London College of Printing in 1986. He received an MSc in Interactive Systems Analysis from the University of Surrey in 1995, and is currently completing a PhD at the University of Derby. He has authored a number of graphic arts textbooks, including Understanding Digital Color (GATF), and Digital Photography (Pira International). He is active in CIE TC8-03 Gamut Mapping and his current research interests are gamut mapping and colour difference. Lindsay MacDonald is Professor of Multimedia Imaging at the Colour & Imaging Institute, University of Derby. For 18 years he was with Crosfield Electronics Ltd (now Fujifilm Electronic Imaging), where he designed and wrote the software for the world's first computer-based page composition system in 1977. Professor MacDonald is a Fellow of the British Computer Society (FBCS), the Institution of Electrical Engineers (FIEE), the Royal Photographic Society (FRPS), and the Royal Society of Arts (FRSA). He is co-author or co-editor of a number of books, including Computer Generated Colour (Wiley), Display Systems: Design and Applications (Wiley), Colour Imaging: Vision and Technology (Wiley) and Colour Image Science: Exploiting Digital Media (Wiley). Light and colour (A. Tarrant). Instruments and methods for colour measurement (D. Rich). Colorimetry and colour difference (P. Green). The CIE 1997 colour appearance model: CIECAM97s (M. Luo). Colour notation systems (P. Rhodes). Overview of characterization methods (P. Green). Methods for characterizing displays (R. Berns and N. Katoh). Methods for characterizing colour scanners and digital cameras (T. Johnson). Color processing for digital photography (J. Holm, et al.). Characterizing hard copy printers (P. Green). Color management and transformation through ICC profiles (D. Wallner). Colour gamut determination (M. Mahy). Colour gamut mapping (J. Morovic). Implementation of device-independent color at Kodak (K. Spaulding and E. Giorgianni). Engineering color at Adobe (J. King). Colour management in digital film post-production (W. Lempp and L. Noriega). Managing color in digital image libraries (S. Süsstrunk). Standards activities for colour imaging (D. McDowell).